This tee y'all - it is a new favorite that I have worn for weekend frolicking in Nashville, after work meetings, & way more than I would like to admit to my teaching job! I love that it is a really thick knit - totally reminding me of much more expensive St. James tees! Scoop it up for only $44! 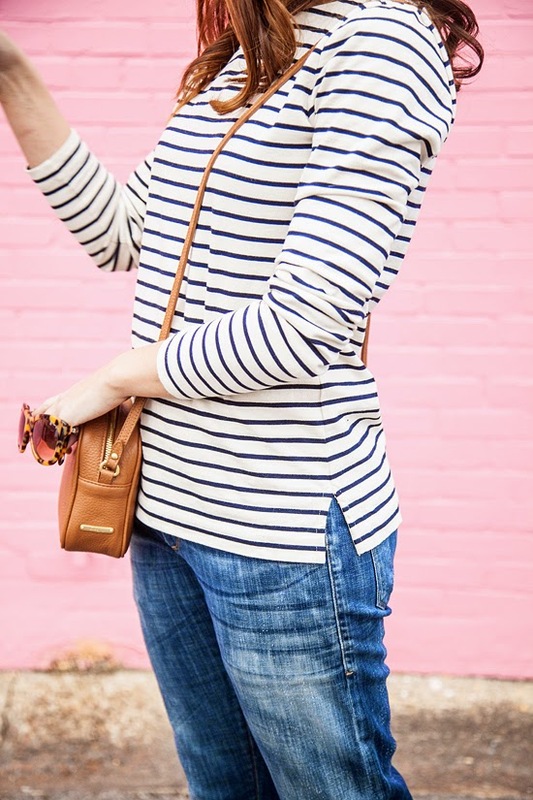 I am also interested in trying the new striped tees from Everlane (can you have enough striped tees!?!? Is that even a thing!?!?) - Have you given them a try yet? This is the look of my weekend these days - thankfully Nashville has been so mild & we have been getting out to enjoy it! Two weekends ago, we rocked out a pub tour via bikes (the ride share B-cycles are awesome & so are Yazoo, Jackalope, & Tennessee Brew Works breweries! ), & then this past weekend we totally stalked The Grilled Cheeserie food truck (#YUM)! What has your weekend looked like lately? 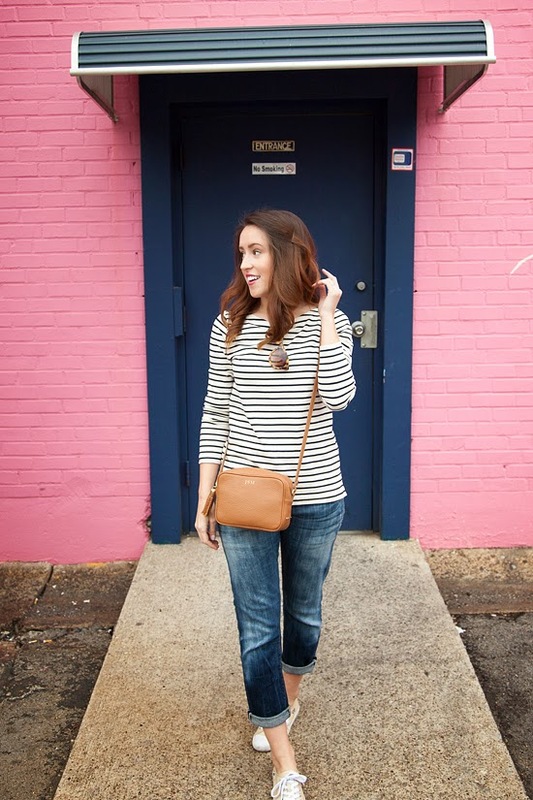 Striped tees + jeans are definitely my go-tos for the week. Those leopard print sunglasses are perfection! You look great! 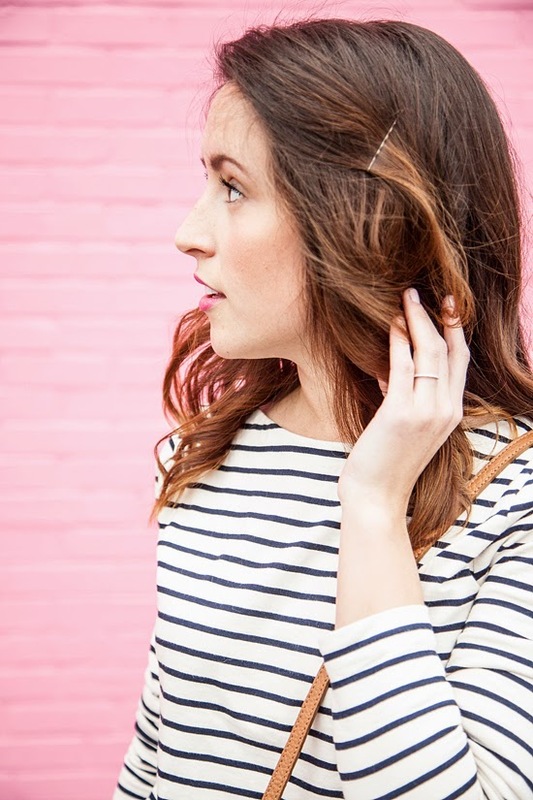 I ordered the striped shirt from Everlane - I don't have my hopes up (I really wanted a black and white one!) but I HAD to at least try, ya know? Now I need to go buy this tee, because it's perfect. gorgeous and simple! you always look fab! Cute pairing... love the shoes; normally flats are my go-to for casual time but I'm really digging cute and feminine tennies. Love your photos. You look beautiful in them. 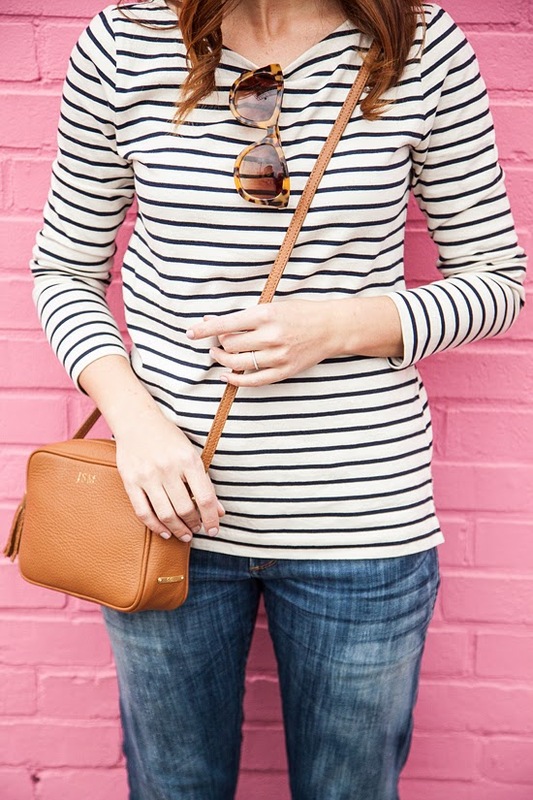 Your striped tee is so classic. What a great casual look. 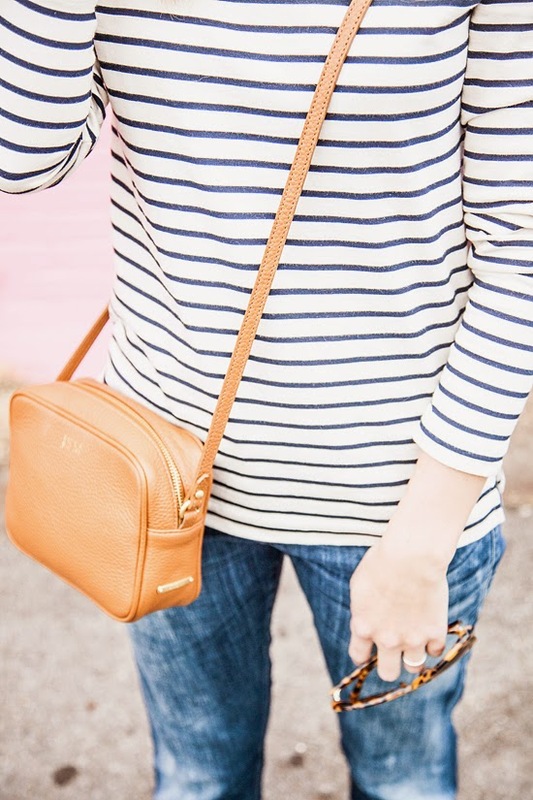 The stripes and rolled up jeans are so cute! love this casual look! 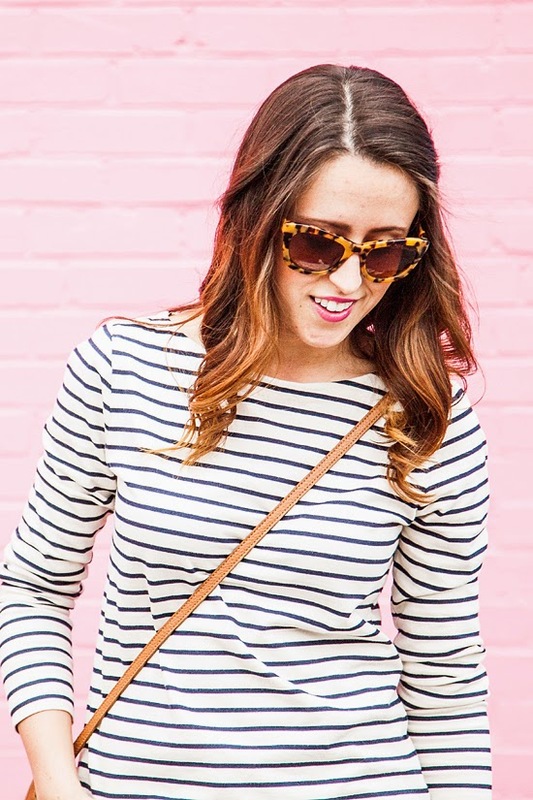 I could not live without my striped tees! I've been eyeing that exact top and you look fabulous! Do you find that J. Crew Factory runs true to size? I usually wear a x-small in Loft but I've never ordered from J. Crew and am not sure if I should size up or down.